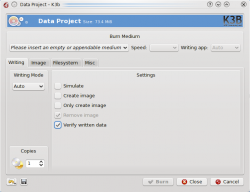 K3b is a simple, yet powerful and highly-configurable graphical optical disk burning application for audio, video, data projects and more! If you have used a burning program such as Nero under Windows, K3b will feel quite familiar. 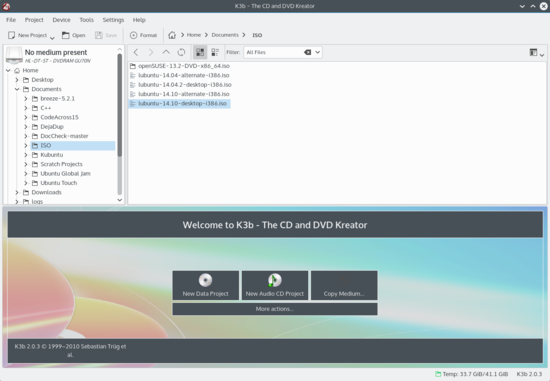 Featuring a simple, yet powerful graphical interface, K3b provides various options for burning a CD, DVD, or BD (Blu-ray disc). Various types of optical projects are supported including (but not limited to) audio and data, video projects for DVD and VCD, as well as multi-session and mixed-mode discs. K3b also has the ability to erase re-writable media and can perform more complicated tasks such as audiovisual encoding and decoding. When you run K3b for the first time, you may find K3b informing you that no optical writer drivers have been found, meaning you will not be able to write to any optical discs. There is no need to panic as K3b will open the Permissions tab on the Programs page of the configuration dialog, where permissions can now be changed. In all modern systems optical devices belongs to a certain user group (e.g. "cdrom"). If the current user does not belongs to this group, he is offered to add himself to it on this tab. Most of the default settings can simply be left alone. It is however, recommended that you do take a look at the Advanced Settings page. Here you can set various important settings, if required. Use Burnfree should be set — it controls the burn, ensuring that the buffer never gets dangerously low (which reduces the quantity of bad burns). You may wish to automatically erase re-writable disks. The option Do not eject medium after write process is invaluable if your drive is one that cannot be closed quickly enough for Verify to happen. Now choose what is to be burnt. The top half of the screen is the source pane; it functions like a file manager. You can choose ordinary files from mounted data volumes or audio tracks from inserted audio discs. Names of audio tracks are automatically read from CD-TEXT data, if your CD drive supports reading it, or generated using CDDB; the exact format is controlled by a button in the bottom pane. If the names are incorrect or simply do not match the description of the disc, you can edit them using the toolbar button. Your changes will be cached locally and submitted to the master registry at FreeDB. Internet connection fees apply. If the whole record is performed by the same artist, leave the track artist entries blank, fill the Album artist, save to CDDB and requery. Now that you have your sources at hand, simply drag and drop the files and directories you wish to burn onto the large pane to the right at the bottom; this is the model pane. Behold a tree of your chosen files forming to the left. Should there be some files or directories which you do not want to burn, these can be easily removed from the project by simply removing them from the panel at the bottom. Select the file to be removed (you can control-click to select multiple ones), then choose Remove from the context menu. If you need to compress audio, create a new audio CD project, add the files to be converted and press the button Convert Tracks. This will not affect the contents of the CD if you decide to burn it; however, you will be able to use the compressed files elsewhere. Make sure the original files are lossless (wav or FLAC), otherwise the result will be unsatisfactory. The top line will be the title of the disk. In many cases this will be fine, but if you would like to change this to something else, simply rename it using the context menu. You are now ready to hit the Burn button. You will see on my screenshot that no disk was present. When you have inserted the appropriate disk you will see a description of it on that line. There are still one or two choices to be made. I would recommend that you set Verify written data, then hit the Save icon at the bottom of the screen, ensuring that it becomes your personal default. For most modern drives it's safe to leave mode and speed to Auto. If you may wish to burn another copy of the disk at a later date, select Create image, which will save having to set up the burn again. Set the number of copies you want to burn, then, when you are satisfied, hit Burn. This page tells you how to burn an audio CD from your stored files. This page was last modified on 6 January 2012, at 20:11. Content is available under Creative Commons License SA 4.0 unless otherwise noted.